We have developed the new ADMAG AXF series, the world's first magnetic flow meters with an electrode adhesion diagnostic function, as well as various application functions. This paper describes the fundamental principles and development methods behind the new functions, and the advanced technology of the ADMAG AXF series, such as the linearity improvement of flow rate measurement and the decrease in variation between sensors by magnetic circuit simulation, the adhesion diagnostic function, and a full dot matrix LCD that can indicate what type of maintenance work should be performed when an alarm is issued. Recently, however, flow measurement applications are required to offer increased performance and functions as well as ease of maintenance, due to technological advances in production systems, high-mix, low-volume manufacturing, and other factors. Against this background we have released as a successor to the ADMAG series, the ADMAG AXF series, which has further strengthened performance, functions, and user friendliness. Figure 1 shows an external view of the ADMAG AXF products. This paper introduces the AXF's features, principles, and technological concepts. This chapter explains the major features of the ADMAG AXF series products. To develop the ADMAG AXF we utilized numerical analysis of magnetic fields extensively, an area in which notable progress has been made in recent years. This technique enabled us to freely analyze magnetic field distributions that are subject to different conditions. These magnetic field distributions data can subsequently be used to obtain a linear relationship between flow rates measured by a magnetic flow meter and flow speeds, using our proprietary software which calculates the magnetic flow meter's electromotive force. 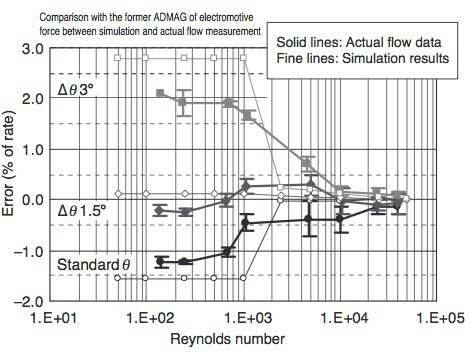 Figure 3 compares linearity changes between actual flow measurement and simulation which uses magnetic field analyses and the electromotive force calculation software, with varying θ, which is the exciting coil's opening angle (see Figure 4). 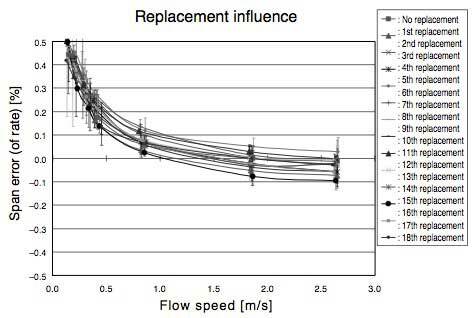 An actual linear relationship which applies to magnetic flow meters and flow speed was successfully obtained using simulation as shown in Figure 3, where the results of the actual flow measurement, indicated by solid lines and filled figures agree with those of the simulation, shown with fine lines and open figures. Both a reduced development period and improved accuracy were achieved thanks to this newly established method. Grounded on the aforementioned simulation tool, we verified the former ADMAG's linearity performance and consequently found that the positioning accuracy of the coil, core, and return circuits—collectively referred to as a magnetic circuit, which is a magnetic field generator of magnetic flow meters—was not adequate to reach the ADMAG AXF's targeted linearity accuracy rate of 0.2%. 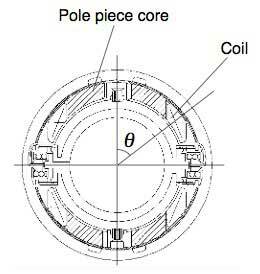 Figure 4 shows the magnetic circuit of the former ADMAG, which is afflicted with two problems, namely the existence of clearance between the pole piece core and the exciting coil, and the expense of machining the coil to precise dimensions. As can be seen in Figure 3, the opening angles ( θ ) of the exciting coil and the pole piece core influence the magnetic flow meter's linearity performance. Under these conditions, it was an essential task to design a new magnetic circuit that would allow the coil to be manufactured as well as positioned with outstanding accuracy. To meet this challenge, we used the simulation tool intensively and eventually alleviated the influence of the coil dimensions on the flow meter's linearity by placing the coil on a plate core as shown in Figure 5. Figure 6 shows linearity errors caused by the coil's opening angles with and without a plate core, according to which using the plate core can mathematically reduce the error to approximately a third. Figure 7 shows changes in linearity performance calculated from actual flow measurement with varying opening angles of the plate core, which indicates that the linearity accuracy can be controlled with the plate core's dimensions. As the plate core is a steel plate that is stamped with a press, it is easy to manufacture the plate with exactly the same dimensions and thus to attain higher linearity stability than the former ADMAG. 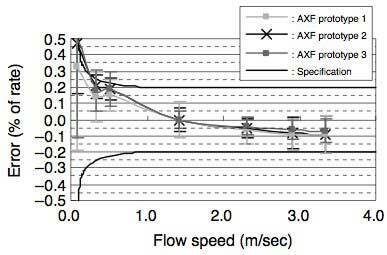 Figure 8 shows the linearity performance of three prototypes of the ADMAG AXF series with flow speed using actual flows, which indicates an extremely low degree of anomalies between individual AXF products. As a result of the varied analysis technologies and accurate simulation as shown above, we were able to reduce the number of prototypes produced and consequently the total development period, as well as to develop products with excellent accuracy, achieving that which is usually unattainable through a trial-and-error evaluation with prototype models only. Dual frequency excitation is Yokogawa's unique method that increases noise resistance and response speed for high-frequencies, as well as zero stability for low-frequency excitation simultaneously, by superimposing high-frequency excitation signals on low-frequency ones. Slurry and fluids with low electrical conductivity exhibit a so-called 1/f characteristic where a higher level of noise is found at low frequencies and vice versa, as shown in Figure 9. 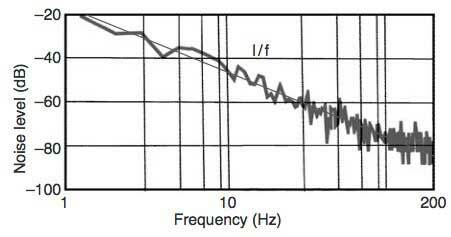 Therefore it is evident that high-frequency excitation produces low-noise signals with a high signal-to-noise ratio. 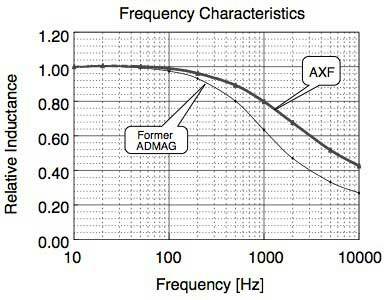 Taking advantage of such a noise characteristic, the ADMAG AXF series has greatly increased its slurry-noise resistance by approximately doubling the frequency for high-frequency excitation dual frequency excitation, compared to that of the former series (see Figure 10). This technique enables fluids with a conductivity as low as 1 μS/cm to also be measured. In return for this double frequency, however, we were faced with the need to improve the frequency characteristics of the flowtube's magnetic circuit. 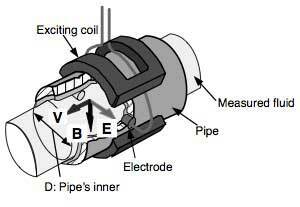 This was not possible for the former ADMAG which houses the exciting coil inside the pole piece core (see Figure 4), therein being subject to eddy currents. With the ADMAG AXF, on the other hand, we rearranged the structure, including eliminating the pole piece core (see Figure 5), thereby successfully improving the magnetic circuit's frequency characteristics twofold or more (see Figure 11). 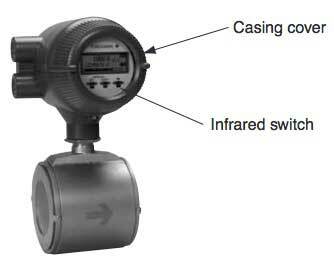 Magnetic flow meters are used in a variety of applications, and if some insulating material has adhered to the electrodes, flow may not be measured correctly due to the flow rate fluctuates, hunts or overranges. As a solution to this situation, the ADMAG AXF has incorporated a new function that diagnoses the adhesion of insulator materials to the electrodes. Figure 12 illustrates the electrode adhesion function. 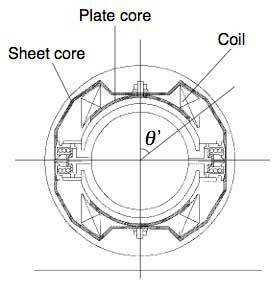 The adhesion level can be judged by measuring the resistance between an electrode and the earth ring. 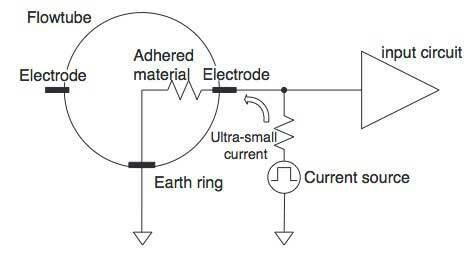 To this effect, an ultra-small, rectangular current pulse is fed from the electrode to the earth ring in order to measure the resistance using Ohm's law. The pulse frequency is synchronized with even multiples of the flow signals' frequencies. When the flow signals are operated, the pulse frequency is cancelled out and thus does not influence the operated computat ion outputs. Conversely, when the adhesion diagnosis signals are operated, the flow signals are cancelled out with no influence on the diagnosis results. This kind of signal processing makes electrode adhesion diagnosis possible even during flow measurement (see Figure 13). The severity of adhesion is judged in four levels based on pre-defined values. 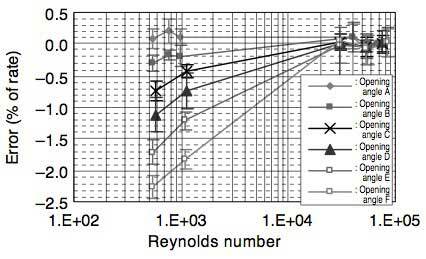 Figure 14 shows an example of adhesion level results, indicating adhesion level 3, which facilitates the visual identification of adhesion development. Level 3 corresponds to a warning and a status signal can be output. When the adhesion level is judged to be level 4, an alarm output can also be set. Although the adhesion criterion levels are preset to reference values at factories, they can be changed by users depending on their applications. Previously, when insulating material adhered to the surface of a flowtube's electrode, it could not be cleaned off until the flowtube was removed from the piping. With the ADMAG AXF, as shown in Figure 15, multiple components—an O-ring, an electrode, a spring, washers, and an electrode cap—are combined into a single unit by means of a retaining ring, thereby expediting the removal of the electrode unit without the need for disassembling the components. This enables the adhered material on the electrode surfaces to be cleaned off without removing the flow meter itself from the piping. The electrode sealant is a fluorine rubber O-ring that prevents fluid leakage when it is subject to pressures three times greater than the maximum specification under allowable operating temperatures (10°C to 160°C). 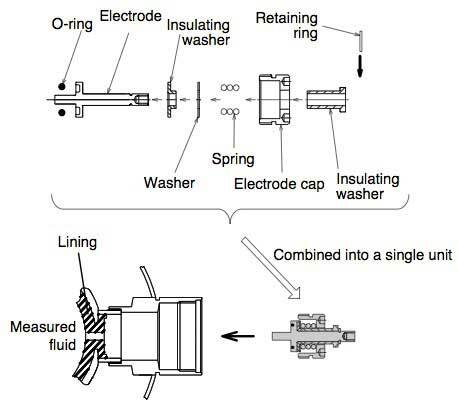 Moreover, as long as the electrode unit is installed with a specified tightening torque, span errors that are caused through the attachment and removal of the unit have been confirmed to fall into within 0.1 percent, a range which affects measurement accuracy negligibly (see Figure 16). The ADMAG AXF series uses non-contact infrared switches in the display (see Figure 17). Figure 18 shows the operating principle of these switches. Switch operations are detected when infrared rays emitted from a luminous device are reflected by an operator's finger and thus enter a photoreceptor device. As shown in Figure 18, simply touching the display glass of the casing cover can set and change parameters, and the cover does not have to be opened. 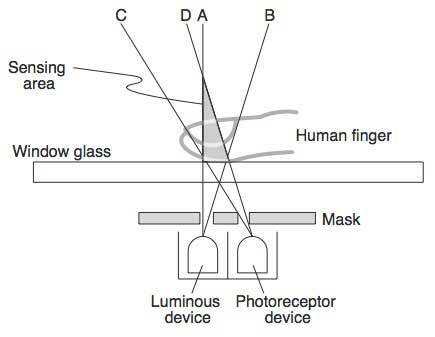 For reasons related to the operating principle, switches can operate whenever infrared rays enter the photoreceptor device, even if the operator's fingers are a little away from the glass. This may lead to insufficient operability for users or even mis-settings, due to inconsistency between their senses and the actual operations. 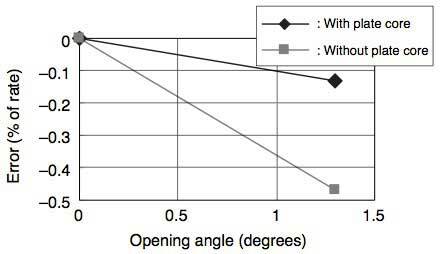 To compensate for this principle drawback, we limited the allowable optical paths as shown in Figure 18. Both the devices are covered with a mask with apertures and the paths were designated by adjusting the positions and sizes of the apertures. The sensing areas are determined by lines A and B, as well as lines C and D, and the switches can operate only if the operator's finger is placed therein, thus improving user's operability. Lately, as seen with cell phones, display devices have advanced remarkably. In line with this trend, users of field instruments are demanding increasingly easy and versatile input methods. In response to these demands, the ADMAG AXF series implements a backlit full dot-matrix LCD for its display device. This LCD has a resolution of 132 dots (horizontal) by 32 dots (vertical), which facilitates a maximum of 22 columns wide and up to 4 lines high. At the time of shipment from the factory, the display is configured to indicate only one line, the instantaneous flow, in a large font. The display enables arbitrary selections of displays from one line to three lines. Figure 19 shows an example of three-line displays. First line is designed with the capacity to indicate characters a little larger than other lines for better legibility. Items that can be displayed include the instantaneous flow, the instantaneous flow on a percentage basis, and the integrated flow. Bar graphs can also be indicated, capitalizing on the merits of dot matrix displays. If an alarm occurs, normal mode and alarm mode are displayed alternatively. As shown in Figure 20, the ADMAG AXF series indicates an alarm on the upper display with the corrective measures on the lower display. Users can see an outline of remedies without reading instruction manuals. 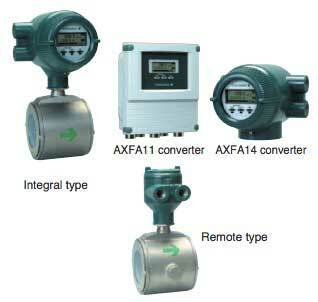 The AXF alarms are divided into three categories, namely system alarms, process alarms, and setting alarms. For the electrode adhesion diagnosis and other functions, a non-alarm category called "Warnings" is also provided, which simultaneously displays the normal flow and a warning. When in the parameter setting mode, displays as shown in Figure 21 are available, indicating a parameter number and name. Both parameter and alarm names can be displayed in not only English but also other languages (Japanese, German, French, Spanish and Italian). So it is easy and convenient for various country person to read and write parameters. This paper has introduced the new technologies which were employed in developing the ADMAG AXF series, with a focus on magnetic field analysis. We believe that through these sophisticated technologies we have succeeded in providing users with a wider range of applications for magnetic flow meters based on their demands, as well as in enhancing the ease of flow meter maintenance. We sincerely hope that the ADMAG AXF series will be used effectively by customers, and look forward to hearing their comments and requests. ADMAG AXF is a trademark of Yokogawa Electric Corporation. Other names and product names that appear in this document are registered trademarks or the trademarks of the respective holders.